Thank you for all that you Have taught me, especially the time and effort that you put into my Tai-Chi. It has made me realise that Tai-Chi is a great art that i will always be able to practice for years to come. It will also help my hip and general health. I know that it will take many years and training hours, but i also understand the power it can have. (Also please thank Master Hu for me for everything he taught me also, especially Qi Gong). Myself and other students notice the fluidity and power in your movements, and enjoy watching them, which is why we were so keen to film you. You can also see your internal work when you taught our Shaolin class (which i really enjoyed). I want to say that you are an extreemly good teacher! and hope that you will continue to pass on your skills to the dedicated students that visit in the future, take care of yourself. Thank you for hepling me get through my forms in the last month. I hope we both made Master Wang proud and I have enjoyed learning from you. I know I speak for all the students when I say that you an exelent teacher. Thankyou for everything and hope to see you again. I miss you very much and I miss the academy, I hope you are well. I am still practicing everything you taught me thank you so much for the positive influence you have had on me, you have improved my quality of life! You taught us all so well and we will never forget you. Sorry it has taken me so long to send an email to you. I am now back at university in the UK and have moved into a house with Mike and Tom and some others. We are all very happy and are now concentrating on our studies once agian. Every morning we go running and practice our basics in the park and then practice Qi gong. Our house has a small garden where we can practice forms and have a punch bag for practicing Sanda. I wonder what it is like at the academy now and how many people there are. I hope Chris and Federiko are training hard! Please say hello to other masters and tell him that Mike and I are practicing what he taught us. Once again thank you so much for everything and for your wise words. Summary of my study of chinese martial arts. 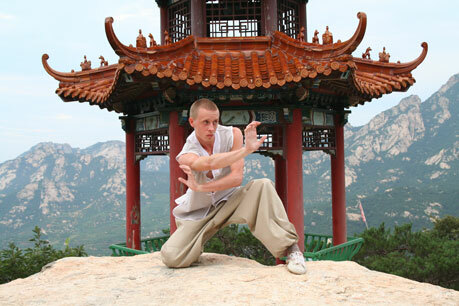 When I first heard of the shaolin-monks I was absolutely amazed of their great skills. 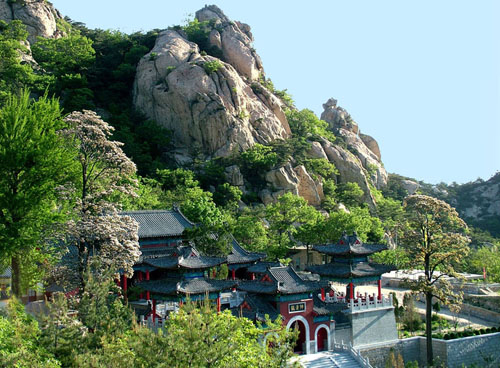 But of course I know that they have to dedicate a big chapter in their life to train in shaolin temple. Some of them even their whole life. 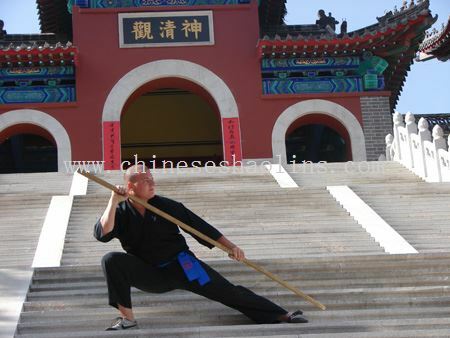 However, after a while my interest made me go to China to study Saolin kung fu. 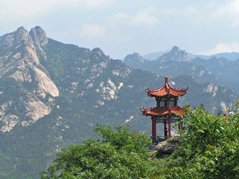 I have been to China from august 2005 until September 2006. During that period I studied not just Shaolin kung fu but also mantis boxing. I have never heard before of that style but when I started to learn mantis I became more and more interested. At the beginning the training was quite hard but after a while when your body gets used to train every day then you can enjoy your improvement. Your body will become stronger and more flexible. But you should be honest with yourself. It is not enough just to go to China. If you want to improve you need the will to work hard. But then you can earn a great benefit. 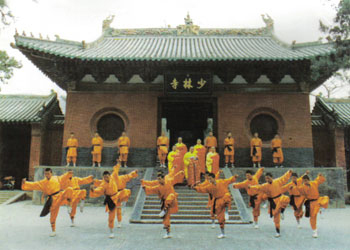 <p class="During the 14 month of my training I learned shaolin-forms and mantis-forms as well. Students often say to learn forms is not very practical. Honestly speaking that is nonsense. Things are just then not practical if you are not good at them. So it depends on you if you make things practical. When you are able to do a form really well then you are also able to use the actions of a form in a fight. At the beginning you need patience and a strong will. Everybody had to start from beginning once. 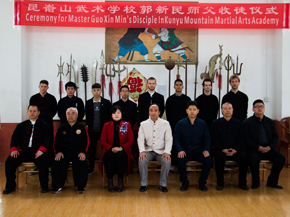 Also students who are going to china to learn martial arts have to. You have to start with basics. Basics as kicks, punches and also stands are very important for learning any kind of martial arts. That is why you have to do them again and again. The better you are at basics the easier you are able to learn advanced things later. That is the way the masters will teach you. You just have to follow your master and then you are able to achieve a great success. 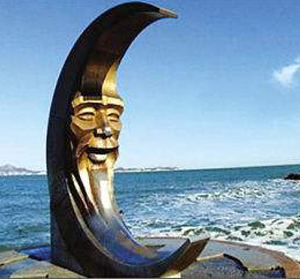 I am very glad that I have been to Yantai to learn martial arts. 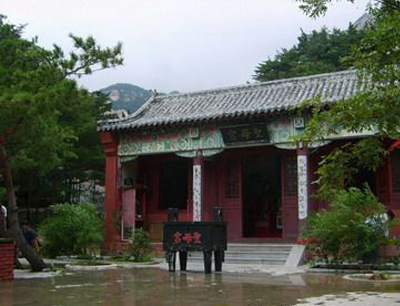 During my study I learned Taiji, Qigong, Shaolin kung fu and mantis boxing. The masters are the best I ever met. Finally the conditions to learn martial arts are great. Now it depends on your ambition how serious you handle the training. I have seen students who were able to improve in a really short time. Even some students could discover abilities which they haven't known about themselves before. For instance a student could do the back flip after a really short time. I think there is no limiting to learn something. It doesn't matter what age people have. Decisive is the will of somebody to learn something. Once there was a man in our academy who was 75 years old. He was there to learn Taiji but even he could do some running and kicks. Another example is our Qigong master. He is more than 70 years old but he is in a better shape than many students who are 40 to 50 years younger. All these things are part of a great experience which I made during my study. All the knowledge I gained I could take back home to keep on practising on my own. But hopefully once I will go back to China to learn some knew things. I am looking forward to that. I want to say thanks to all the masters for their teaching and I want to express my deepest respect to them. I will always remember you and I hope I will see you again in the future. n whilst practicing and the more I experienced Qi and, the more I intrigued by it. I have a skin condition called Psoriosis and when I arrivedI have had a fantastic time here for the last eight weeks. 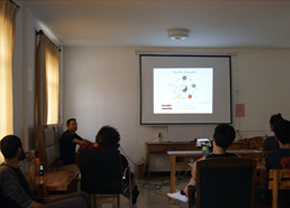 Both the internal and external training are very challenging and very positive. 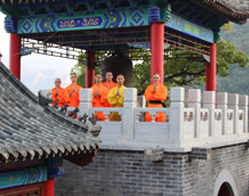 During the time I have been here my Shaolin basics have improved dramatically and through thorough practice and the excellent teaching I have learnt three first forms and a staff. Sanda was also something I really enjoyed, having not done any kickboxing before. I have learnt to put power into my movements by practicing the techniques taught in class and not relying on just strength. To practice these techniques, I did shadow boxing, pad work and hitting the bag. Qigong has been the thing that I have got the most from during my stay. To start, I found it difficult and tedious, dreading each session. However, I quickly learn to relax into the state of meditatio at the academy it was coving my body. Thanks to the Qigong and the relaxed lifestyle here my skin is now clear of Psoriosis. It has not been in such good condition for over two years. Before I arrived I was unaware of the possibilities of internal healing and the now I feel that this is just the beginning. If there is any advice I could give to anyone training here it would be to respect your masters completely, listen and take in every piece of advice they offer. Watch them carefully in training so that you can perfect your own movements and use all the available time you can to train. The more time and determination you put in the better your Gongfu will be.